The automatic operation of garage doors is determined and enabled by the opener and most specifically by the opener's motor. Garage door openers actually incorporate many parts, which transfer the electric power to the door but the real heart of openers is their motors. They are connected with electricity and their horsepower must always be enough for the door's weight. Most residential doors need ½ hp while lately some manufacturers started producing even motors with over 1 horsepower which are ideal for very heavy doors. Openers have a reverse mechanism for protection from accidents, a cord for the emergency release of the electric operators and a drive system. These are their main parts. All parts of garage door openers are significant. They work together so that electric power will be transferred to the door and open it. The reverse system ensures that the overhead door won't close on anyone and the chain, screw or belt drive guide will make sure the door moves. We take care of each and every opener part during garage door opener maintenance. All technicians at Garage Door Repair Columbia Heights are cautious and extremely thorough during services. We understand how critical is for clients to have door operators they can trust and we make sure they do. 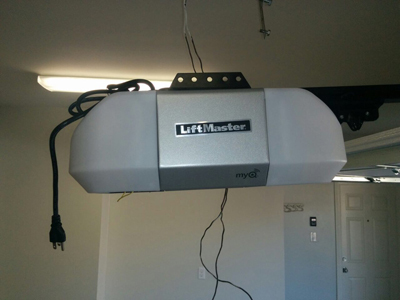 Our garage door opener installation is perfect in all aspects. We don't just make sure the opener is properly fastened and installed but also pay attention to the proper installation of all safety features for perfect compliance with the UL 325 regulations. The first thing we check when we service opener mechanisms is their safety features. Of course, we are extremely fast when there are specific problems leading to the assumption that there is something wrong with the sensors or any other part of your Marantec or Liftmaster door opener. With our experience in garage door repair services and our knowledge of operating systems, you can be sure that our work is efficient. We are quick, offer emergency opener service and guarantee your safety. Contact our company for any opener problem now.